Pininfarina's still unnamed concept is a modern interpretation of the 1966 Alfa Romeo Duetto spider. TURIN – Pininfarina will unveil at the Geneva auto show a modern interpretation of the most famous car it produced for Alfa Romeo: the 1966 Duetto spider. Actor Dustin Hoffman was driving a red Duetto spider in the famous movie, "The Graduate." Still without an official name, the Pininfarina concept is a two-seat spider with the original Duetto layout: front longitudinal engine and rear drive. Pininfarina currently builds the Alfa Spider, a car based on the 159 sedan layout with a transverse engine and front- or all-wheel drive. "Our Spider concept is classic in its proportions but refrains from retro design, laying out a design language for the future," said Lowie Vermeersch, design director at Pininfarina. The lines of the new spider are as simple as possible, with thin front and rear lamps which just compel the function they have to -- illuminate -- instead of being bulky elements of decoration. "With this concept car we want to show the world Pininfarina is alive and kicking," company CEO Silvio Angori said. Pininfarina announced in late 2008 that it would phase out contract manufacturing in order to concentrate on design and engineering services for automakers, as well as producing an electric car in a joint venture with French battery specialist Bollore. Pininfarina currently builds the Alfa Romeo Brera coupe and Spider, and the Ford Focus CoupeCabriolet in Italy. It also has a joint venture in Sweden with Volvo to build the C70 convertible. 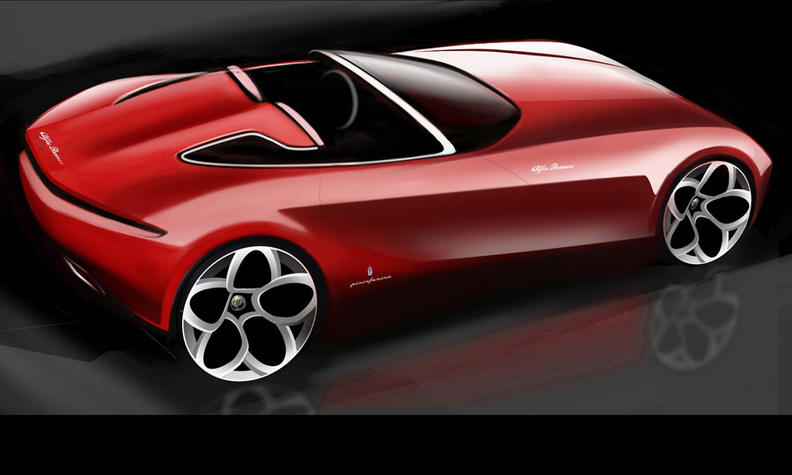 Even if Pininfarina has no ambitions to build the next Alfa Spider, this new concept comes at the right time. Newly appointed Alfa Romeo CEO Harald Wester is working to prepare a new business plan to relaunch Fiat's sporty brand. Fiat CEO Sergio Marchionne will detail the future of Alfa on April 21 when he unveils the 2010-2014 business plan for the Fiat Group. The plan is said to possibly include a new rear-drive spider for Alfa. Fiat is looking into Chrysler's rear-drive LX platform to possibly derive a large sedan, a coupe and a spider for Alfa Romeo. Fiat owns 20 percent of Chrysler. Later this year Chrysler will unveil redesigned versions of the Chrysler 300 and Dodge Charger, which are based on a heavily reworked LX platform that includes a new rear suspension and the adoption of the company's new 280-hp, 3.6-liter V-6 Pentastar engine. If approved, the plan for Alfa calls for returning to the United States in mid 2012 with a range of models co-developed with Chrysler and possibly also built in North America.